Our family lives far far away from our relatives. While we live as expats in Kenya, the grandparents, aunts, uncles and cousins all live in the Netherlands, Germany or the USA. Since we are so far away from our families, my husband and I feel the need to create a lot of family traditions and ground the children in their various cultural backgrounds. One of our traditions is a nice weekend breakfast! It’s an activity that involves the entire family in the preparation. Our current favourites are either thin pancakes, from a Dutch recipe that our nine-year old has down to a science, or German waffles! The latter involves a lot more adult assistance and supervision, but the results meet an exciting crowd each time. Our waffle iron is the exact same waffle iron that my husband had waffles from when he grew up in Germany. My dear mother-in-law brought it over to Kenya at one point in time as she saw it to be more useful here in Kenya, than it would be in Germany between her and my father-in-law. Boy, was she right and her grand-kids have been very grateful for that! The 70’s waffle iron gets pulled out on a regular basis and we enjoy the German waffles! Do you feel inspired to make waffles sometimes? Then try this lovely recipe for some yummy waffles! It was originally from a German Cookbook, but has been altered (or perfected?) to suit our family’s taste! First split the eggs (egg whites in one bowl, egg yolks into another small bowl). Add the salt to the egg whites and beat them until they are stiff. Place the bowl in the refrigerator. 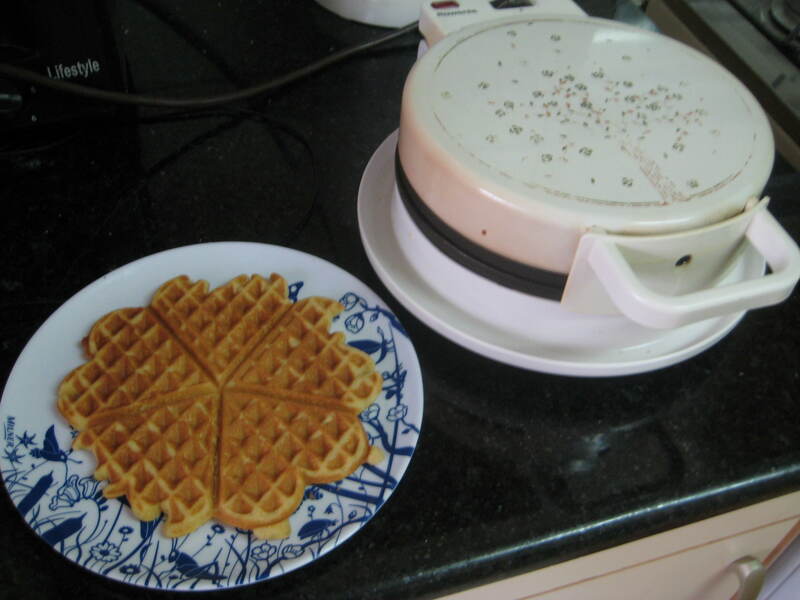 Preheat the waffle iron and put about 3 table spoons of dough into the iron for yummy waffles! Delicious with powdered sugar / lemon juice and sugar / maple syrup / honey!